AudioMUX click is a sound processing Click board™ with digital controls, based on the TDA7468D IC. It can be used to select one of four audio input channels, adjust its frequency response and volume, and send it to the output. There is also a BASS ALC section implemented on this IC, keeping the base in control even on higher volume settings. 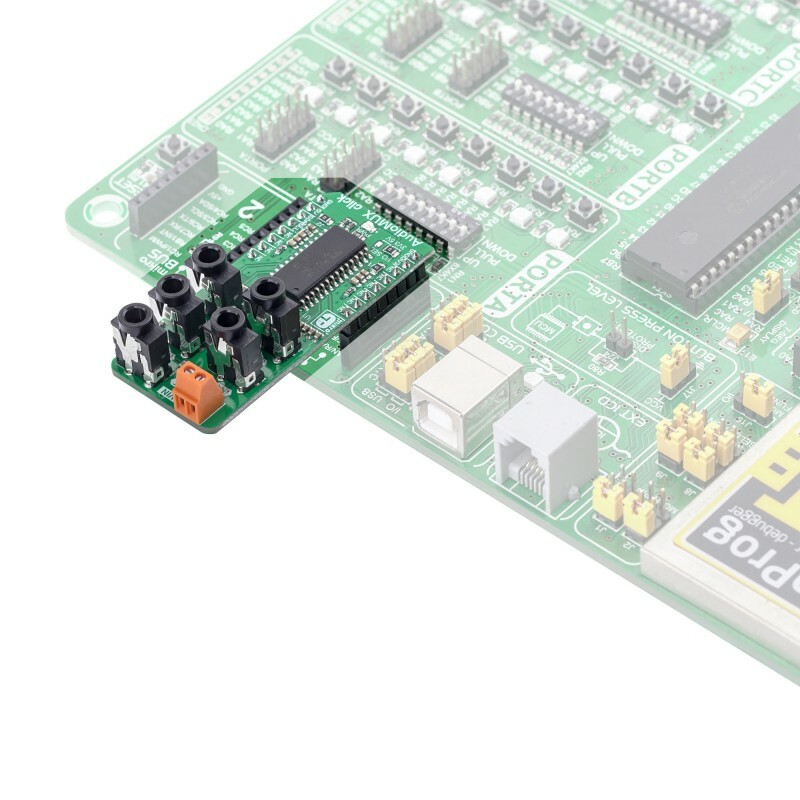 Independent LEFT and RIGHT channel volume control, complete control over the I2C interface, a full set of 3.5mm vertical jack connectors onboard… All these features make this Click board™ a very good solution for the development of all kinds of audio applications. 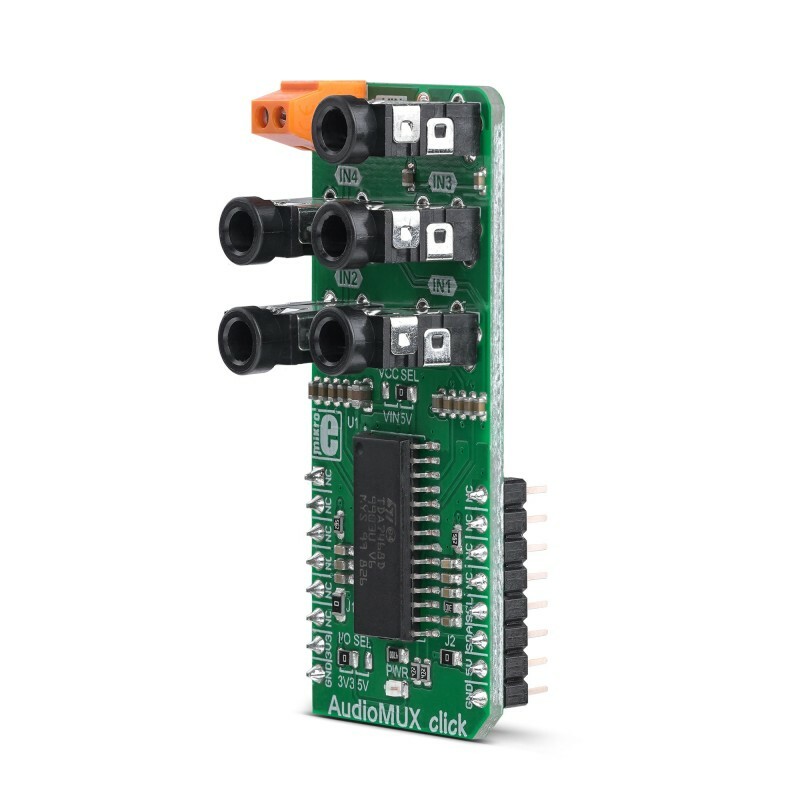 AudioMUX click is supported by a mikroSDK compliant library, which includes functions that simplify software development. This Click board™ comes as a fully tested product, ready to be used on a system equipped with the mikroBUS™ socket. Featuring a set of 3.5mm vertical jack connectors onboard, it allows a simple connection to an existing audio chain. Because of its very good sound characteristics, including 0.01% of total harmonic distortion (THD), signal to noise ratio (SNR) of 100dB, 84dB of maximum attenuation, and more, this Click board™ represents an ideal solution for developing and building audio applications that can be used for various HiFi systems, home stereo components, computer speakers with selectable input, and many other similar audio applications that require a digitally controlled input selection and audio processing. 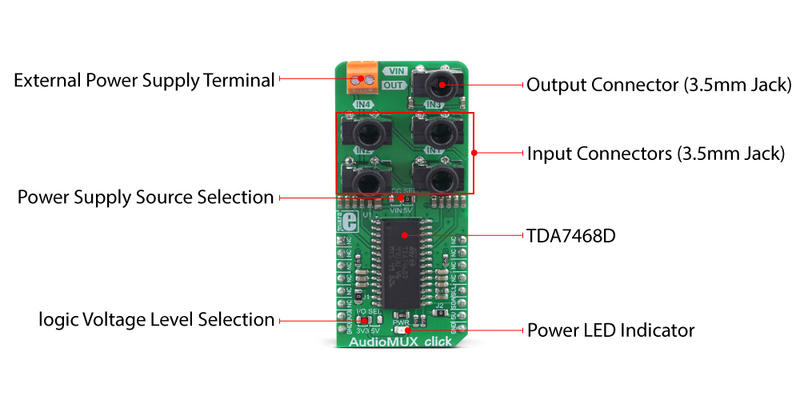 AudioMUX click is based on the TDA7468D IC from STMicroelectronics, which is a two-band digitally controlled high-quality audio processor with BASS ALC feature and a four-channel input selector. This integrated audio processor is quite popular, and it can be found in several brands of HiFi and home stereo systems. Despite its simplicity, it offers a full set of options required for a realization of the four-channel audio multiplexer with volume, balance, and tone controls. The TDA7468D IC is digitally controlled over the I2C interface; however, the internal sections are purely analog circuits, with a separate analog GND reference. There are four input channels which can be selected over the I2C interface. The IC accepts up to 2.5V peak to peak at its inputs. The impedance of the input terminals is 50 kΩ, and each input is decoupled by a 440nF capacitor. There are not many registers in this IC, which makes the firmware development very easy. Each channel is routed to a vertically mounted 3.5mm jack, which allows the Click board™ to be easily interfaced to an existing audio chain. Some registers have a single function, while others are used to control more functions. The datasheet of the TDA7468D clearly explains each register and its functions. The signal is then fed to the first (pre-EQ) volume control section which is able to attenuate the signal down to -63dB, in 1dB steps. If the signal is too high, a clipping might occur when the equalization is applied in the next section. Therefore, lowering the volume in this section will allow more headroom for the equalizer (EQ) section. The volume in this section is determined by the first 6 bits of the volume control register, referred to as the VOLUME 1 bitfield. The last 4 bits are related to the post EQ volume section and are referred to as the VOLUME 2 bitfield. Both volume sections feature independent volume control registers (VOLUME LEFT and VOLUME RIGHT), allowing balance function to be implemented. The EQ sections can adjust bass and treble frequencies in the range from -14dB to +14dB, in 2dB steps. The frequency response of these sections is determined by external RC elements. The Click board™ has these values optimally selected for the best performance. The low-frequency range is processed by a T type bandpass filter with its center frequency at around 32Hz, while the high-frequency range is processed by a high pass filter with the -3dB attenuation point at about 3kHz. A single register is used to control the entire EQ section (TREBLE & BASS register). The BASS ALC is basically a compressor, applied to the low-frequency range. It is a very useful feature, keeping the low-frequency content even when the volume is set to a high value. The low-frequency band will be dynamically attenuated when the programmed threshold value is exceeded, after the programmed attack time. The BASS ALC is automatically turned off when the EQ is set to attenuate low frequencies, as there is no point to use it in that case. There are also some additional settings for the BASS ALC function. For the complete list of features, please refer to the datasheet of the TDA7468D. The BASS ALC function is controlled by bits in the BASS ALC register. The output of the TDA7468D IC can be enabled or disabled by a single control bit of the OUTPUT register. When building audio applications in a purely digital surround, special care should be taken to isolate the audio signal path as much as possible, in order to avoid any noise at the output. This Click board™ is equipped with two 0 Ω resistors (jumpers) at strategic positions. These jumpers are labeled as J1 and J2. They can be replaced either with resistors or with inductors. J1 jumper connects analog and digital GND in a single point. If the reference GND is noisy, using a clean external power supply (PSU), combined with a small resistance value up to 100 Ω in the place of J1, can help in reducing the output noise. The second jumper (J2) can be replaced with a ferrite bead or an inductor, which can help to filter the noise at the positive rail of the power supply. The noise at the output can also be a result of improper gain staging (e.g. all the gains are at their maximum value). The TDA7468D itself is not very noisy, only about 15 µV max. The SMD jumper labeled as VCC SEL is used to select the power supply. If set to 5V, the analog section of the TDA7468D IC will be powered from the mikroBUS™ +5V rail. When the jumper is set to VIN, the analog section of the TDA7468D IC will be power from an external power source, connected to the VIN screw terminal. The external power source voltage should be within the range between 5V and 10V. 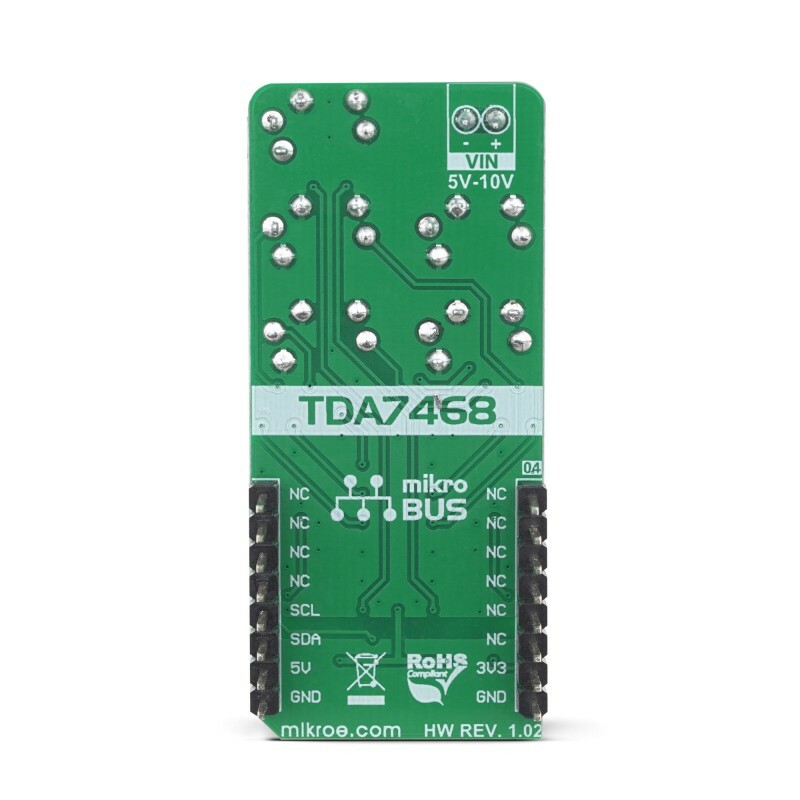 The logic section of the TDA7468D will always be powered from the mikroBUS™, regardless of the VCC SEL position. However, it is still possible to select the voltage level for the I2C bus, allowing communication with a wide range of different MCUs. This can be done by switching the SMD jumper labeled as I/O SEL to either 3.3V or 5V. Applications It can be used in various HiFi systems, home stereo components, computer speakers with selectable input, and many other similar audio applications that require a digitally controlled input selection and audio processing. Key Features High quality audio output, integrated four-channel input selector with tone controls, each connector is a high-quality vertically mounted 3.5mm standard stereo jack, good frequency response, low THD and SNR, it can be directly implemented into the existing stereo system, etc. This table shows how the pinout on AudioMUX Click corresponds to the pinout on the mikroBUS™ socket (the latter shown in the two middle columns). We provide a library for the AudioMUX Click on our LibStock page, as well as a demo application (example), developed using MikroElektronika compilers. The demo can run on all the main MikroElektronika development boards. 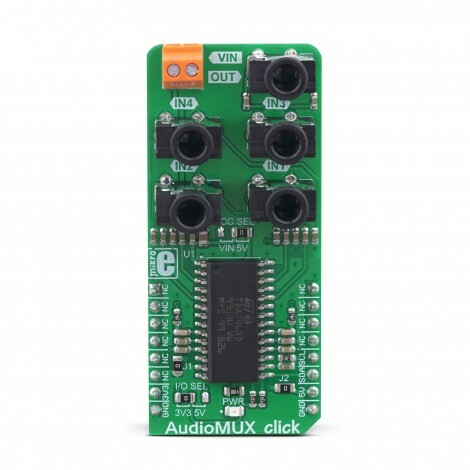 Library offers a choice to perform a control of the AudioMUX Click board. The control consists of input control, output control, gain control, volume control, treble and bass control... The device also can work in Bass ALC Mode by using this library. For more details check the documentation. T_AUDIOMUX_RETVAL audiomux_writeSingleByte( uint8_t regAddr, uint8_t dataIn ) - The function writes one-byte data to the register. T_AUDIOMUX_RETVAL audiomux_selectInput( uint8_t inputSel, uint8_t muteIn, uint8_t micGain, uint8_t micState ) - The function performs an input selection and control. T_AUDIOMUX_RETVAL audiomux_setVolume( uint8_t volume1, uint8_t volume2, uint8_t sideSel ) - The function performs a left or right volume control. T_AUDIOMUX_RETVAL audiomux_setTrebleBass( uint8_t treble, uint8_t bass ) - The function performs a control of the treble and bass for EQ section. Application Initialization - Initializes I2C interface. Application Task - (code snippet) - Initializes AudioMUX device to work with the desired configurations and shows a message on UART when playing is started. Device initialization will be performed only once and after that AudioMUX will work with the same desired configurations.